Home Business Why Borrow to Boost Economy? The total debt stock hanging on the neck of Nigeria stood at N24.39trillion or $79.44billion as at December 31, 2018. The domestic component of total debt attributable to both the federal and state government at the end of 2018 was N16.63 trillion. Besides debt obligations to government contractors, employees and others, big chunk of domestic debt are borrowings from local investors through issuance of treasury bills and bonds by government for project financing purposes and other sundry matters. Director General, Debt Management Office (DMO), Patience Oniha, who in a recent report, revealed that the total public debt stood at N24.387 trillion or USD79.437 billion as at December 31, 2018, said the increase represented a year-on-year growth of 12.25 percent. Further details provided by Oniha showed that more progress was made towards achieving the target debt stock mix of 60 per cent (domestic) and 40 per cent (external). She noted that the share of domestic debt dropped to 68.18 per cent from 73.36 per cent as at December 31, 2017, thereby achieving a mix of 68.18 per cent and 31.82 per cent in the debt stock. According to DMO, the strategy of using relatively cheaper and longer tenored external funds is achieving the expected objectives. Some of the objectives were: to create more space for other borrowers in the domestic market, extend the average tenor of the debt stock in order to reduce refinancing risk and increase external reserves. 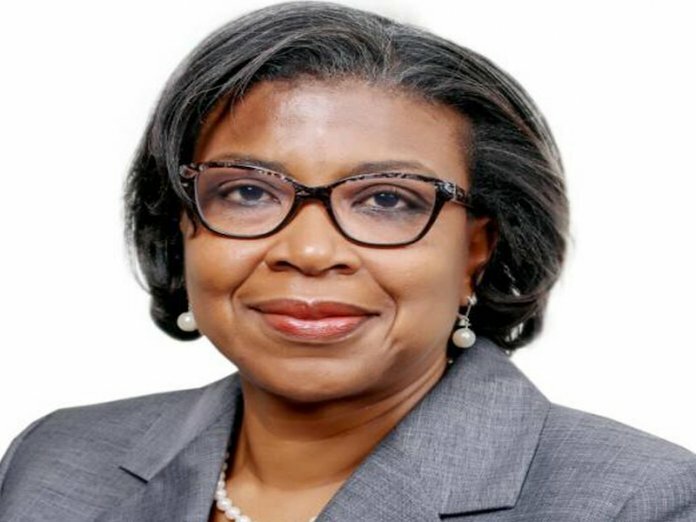 The implementation of the strategy led to an injection of N855 billion through the redemption of Nigerian Treasury Bills in 2018 and a general drop in the FGN’s borrowing rate in the domestic market from over 18 per cent per annum in 2017 to 14 – 15per cent per annum in 2018. Meanwhile, the Minister of Finance, Zainab Ahmed, recently revealed government will again borrow N3.4trillion from the investing public to clear a backlog of N2.7trillion obligations to local contractors working for government as well as pay salary arrears of civil servants. Part of the would-be beneficiaries of the debt settlement are pensioners and players in the oil marketing industry to whom is due some interests on fuel importation. Ahmed, who said the proposal to raise N3.4trillion through a 10-year tenor promissory note, was approved by the Federal Executive Council (FEC) at its last meeting in Abuja, believes going for the option would help revive an economy that has faced low growth since emerging from its first recession in 25 years in 2017. The economy plunged into a recession in second quarter of 2016 with growth contracting by 1.6 percent. But exactly a year after, second quarter in 2017, the economy bounced back, recording a positive growth. The growth came as a result of upward swing in oil price and desperate borrowings by government to finance infrastructure, which revived the dying economy. Growth has been consistent since 2017, though it recorded a drop in third quarter of 2018 before closing at 1.9 per cent in 2018. Besides boosting economic growth, “the note issuance programme would help the government to account properly for its liabilities, as at December,” said Ahmed. While economic pundits cautioned on increasing the nation’s debt stock because of the impact of its repayment on ordinary Nigerians, they are of the opinion that settling debts owed to contractors, payment of salary arrears and other entitlements due to workers among other considerations, will enhance the purchasing power of a large number of Nigerians with a multiplier effect that will boost growth. The Central Bank of Nigeria (CBN) has said growth in gross domestic product should reach 3 per cent in the first quarter of 2019, buoyed by election and government spending, compared with 1.9 percent last year. But while the International Monetary Fund (IMF) shared the optimism of the Nigeria’s Central Bank, going by the outcome of its recent assessment of performance of the economy, it differs on the projection for economic growth as it sees the economy growing by 2.1 per cent in 2019. It, therefore, proffered the ways to boost the economy and achieve a healthy growth. Executive directors of the IMF welcomed Nigeria’s ongoing economic recovery, accompanied by reduced inflation and strengthened reserve buffers. They noted, however, that the medium-term outlook remains muted, with risks tilted to the downside. “In addition, long-standing structural and policy challenges need to be tackled more decisively to reduce vulnerabilities, raise per capita growth, and bring down poverty.” Directors, therefore, urged the authorities to redouble their reform efforts, and supported their intention to accelerate implementation of their Economic Recovery and Growth Plan. On the way forward for the economy, directors of the IMF emphasised the need for revenue-based consolidation to lower the ratio of interest payments to revenue and make room for priority expenditure. They welcomed the authorities’ tax reform plan to increase non-oil revenue, including through tax policy and administration measures. They stressed the importance of strengthening domestic revenue mobilisation, including through additional excises, a comprehensive VAT reform, and elimination of tax incentives. Securing oil revenues through reforms of state owned enterprises and measures to improve the governance of the oil sector will also be crucial. The IMF highlighted the importance of shifting the expenditure mix toward priority areas. They welcomed, in this context, the significant increase in public investment, but underlined the need for greater investment efficiency. They also recommended increasing funding for health and education. They noted that phasing out implicit fuel subsidies while strengthening social safety nets to mitigate the impact on the most vulnerable would help reduce the poverty gap and free up additional fiscal space. The directors recommended stronger coordination for more effective public debt and cash management. With inflation still above the CBN target, IMF generally considered that a tight monetary policy stance is appropriate. They encouraged the authorities to enhance transparency and communication and to improve the monetary policy framework, including by using more traditional methods, such as raising the monetary policy rate or cash reserve requirements. The IMF directors commended the authorities’ commitment to unify the exchange rate and welcomed the increasing convergence of foreign exchange windows. They noted that a unified market based exchange rate and a more flexible exchange rate regime would support inflation targeting. Directors also stressed that elimination of exchange restrictions and multiple currency practices would remove distortions and facilitate economic diversification. The IMF welcomed the decline in nonperforming loans and the improved prudential banking ratios but noted that restructured loans and undercapitalised banks continue to weigh on financial sector performance. They suggested strengthening capital buffers and risk based supervision, conducting an asset quality review, avoiding regulatory forbearance, and revamping the banking resolution framework. Directors also recommended establishing a credible time bound recapitalsation plan for weak banks and a timeline for phasing out the state-backed asset management company, AMCON. The also urged the authorities to reinvigorate implementation of structural reforms to diversify the economy and achieve the Sustainable Development Goals. They pointed to the importance of improving the business environment, implementing the power sector recovery programme, deepening financial inclusion, reforming the health and education sectors, and implementing policies to reduce gender inequities. Directors also emphasised the need to strengthen governance, transparency, and anti-corruption initiatives, including by enhancing AML/CFT and improving accountability in the public sector.